For people who love to play slot games, Divine Fortune is a game that will surely intrigue you. It is an online slot machine game designed around the Greek Theme and has Greek Mythological icons such as Pegasus, Nemean Lion, Phoenix and Medusa as the in-game symbols. The game is particularly fascinating for the slot lovers because it continuously offers bonus features, which keep reflecting on the screen. 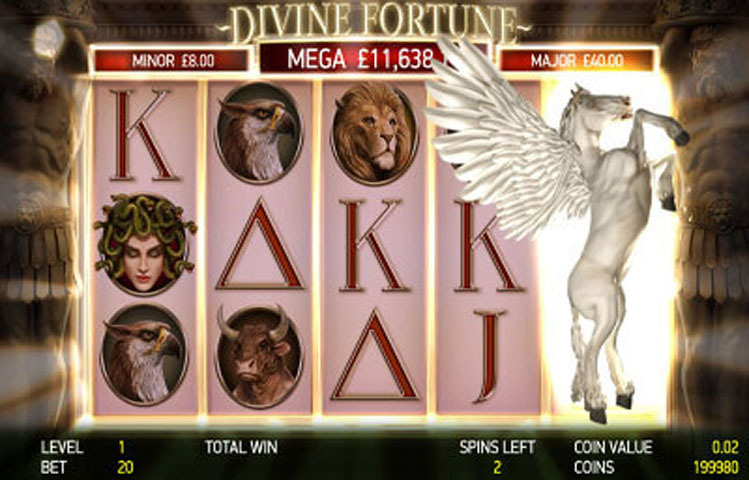 These features make the slot enthusiasts tied to the game for hours on end, and for cautious players, Divine Fortune offers a unique betting experience. However, with all things gambling, it is essential that you play with your guards on and keep a check on your bank roll before making high-value bets. NetEnt is the developer of this highly popular slot game and has been a part of the online casino industry since 1996. The low paying symbols in the game are assigned to the regular A to J symbols. The main features that make the game appealing are falling wild re-spin feature, and whenever during a roll, Wilds Fall on different symbols, a quick free spin is generated for the player. As the reel showcase other wild symbols, the free spin option continues to appear. When the reel has three scatters, the players get the option of Free Spins. Players can get Jackpot feature during the roll as well. Players can multiply their stake for maximum 200 times in the game. Other features that would keep you glued to the game are jackpot feature, wild on wild, free spins and falling wild. With these features, players can be assured of high payouts as they advance in the game. The falling Wild feature is triggered when wilds fall on the symbol at the bottom saying free-spin. The Wild feature is symbolized by Pegasus and is responsible for activating the free spin option. The Divine Fortune has five reels, and with 20 pay lines, players can be sure of coming across many opportunities to get high payouts. The overall gameplay of Divine Fortune is neat and straightforward, and players can be sure of enjoying every bit of their time when rolling their bets on this slot game.